Why do people believe in the paranormal? Earlier this semester in class, Andrew showed us the ‘ghost in the cupboard’ video and then went on to explain how the paranormal cannot be used as an excuse or explanation behind scientific research or experiments. However, even as our world continues to stretch the known limits of science and create new, amazing innovations, there are still many people whose belief goes beyond science, to the supernatural. 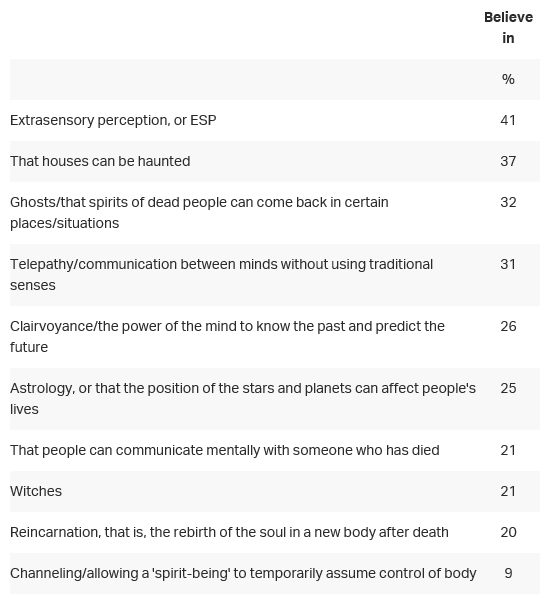 According to the most recent Gallup poll on the subject in 2005, three quarters of Americans believe in at least one aspect of the paranormal, with the majority claiming to believe in ESP (a sort of sixth sense that can involve interacting with ghosts, clairvoyance, or telepathy), or that houses can be haunted by dead people. I can actually count myself amongst some of those categories, but since this is a science class and I only have my own, unsupported anecdotes, I thought instead of talking about the possibility of the supernatural being fact rather than fiction, I would ask why it is that so many people choose to believe in what has not been, and may never be, proven or disproven. It is of my opinion that as the world becomes more modernized and digitally dominated, and as globalization allows all the problems in the world to be known at once, people fall back on routine and belief to stabilize themselves, whether they are old or young. So the factors that lead a person to be more inclined to believe in a paranormal explanation than to seek a scientific one may be due to fear of the future or unknown, religion, or feeling unattached or overwhelmed by the natural world. To find out if any of my theories are shared, I decided to first inspect the elements of a person’s personality that might suggest a tendency to believe in the supernatural. An article published in The Journal of Parapsychology in 2005 by J.E. Kennedy discusses how someone’s personality can drive their belief or skepticism in the paranormal. Kennedy states that pragmatic, analytic personalities tend to be more skeptic than personalities that desire stimulus to feel in control of their lives. The article also notes that while there have been scientific studies of the supernatural, most scientists have more analytic personalities and are thus innately cynical of their own experiments, possibly creating an experimenter’s bias to affect the outcomes. Because Kennedy claims that the personalities that usually believe in the paranormal desire a need for control or to have extraordinary experiences to feel a certain euphoria, I believe that people with those personalities are more likely to seek out the paranormal in natural occurrences. For example, the ghost hunters on TV seek out venues where there have been prior claims of supernatural activity; if they happen to catch a random knock or other unexplainable sound on their recorders, the conclusion they first come to will be that it was caused by something paranormal. Unless the find a direct, physical source the noise might have come from, they will continue to believe what they found is evidence of the supernatural. Skeptics, however, will claim that there were probably dozens of other explanations for the sound, but the paranormal investigators either did not look hard enough, fell back on a type of Experimenter’s Bias, or are too inexperienced to find the correct source. Another influence that leads people to believe in, or at least be more open to, the supernatural is its depiction in the media. 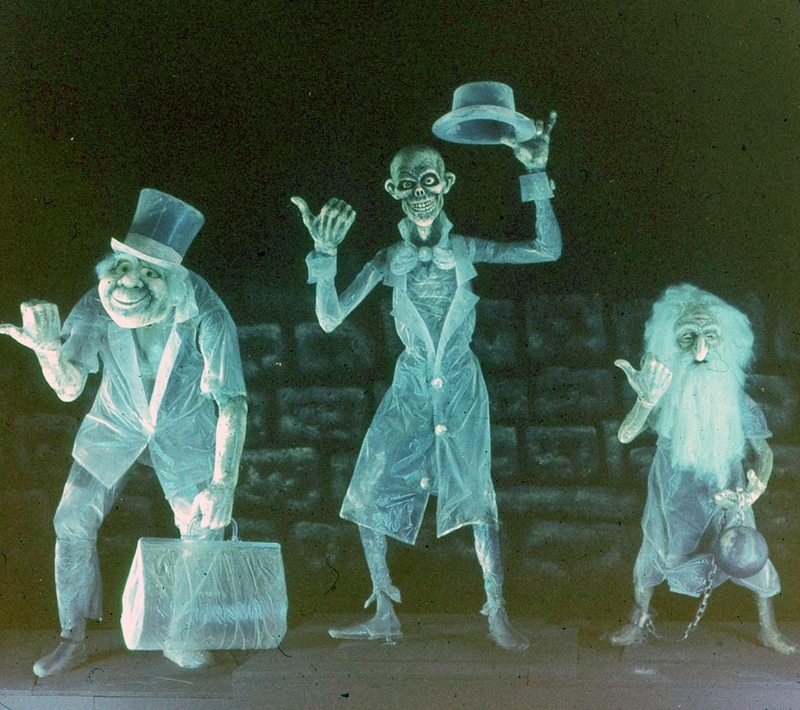 Claims of ghost sightings have been recorded ever since the first century, and have continued to be reported more and more ever since. 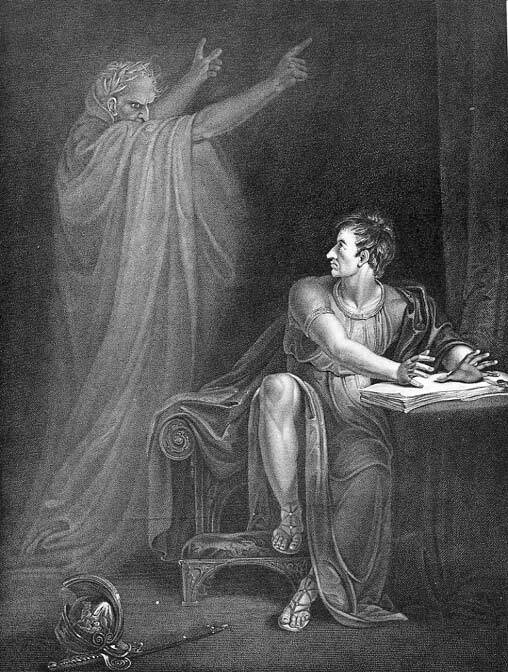 Ghosts appeared in the media rather early as well, through the works of an early second century Greek writer, Lucian, and more ‘recently’ in Shakespearean plays, specifically famous ones such as Hamlet, Julius Caesar, and Macbeth. With entire genres dedicated to the paranormal, it is likely most Americans have seen or read at least one piece of supernatural media. The genre has been exceptionally popular in recent years, with the 1970s-1980s release of movies like The Exorcist and Poltergeist, and the recent Blair Witch Project and Paranormal Activity series. This isn’t even mentioning the sharp increase in extraterrestrial sightings in media, which I’ll leave out of this post since it’s really a topic of its own. But viewers know that movies are fictional, or at least skewed versions of real accounts. Television is a different story. In an article written by Glenn G. Sparks, who has written several other articles on the effects of mass media on the viewing public, Sparks conducted an experiment on students to investigate the influence of a disclaimer tag at the beginning of a paranormal television show. Sparks had four groups of students watch the same show but with different disclaimers, ranging from no tag at all to claiming the show’s story violates the laws of nature. There was also a control group that was tasked with simply watching a sitcom without any paranormal factors in it. 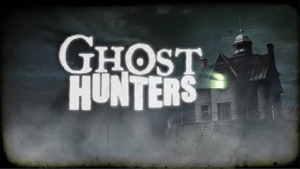 The results showed that the groups that did not received the disclaimers were more likely to support the paranormal claims in the episode, whereas those who did had more doubts. The downside to this interesting study is that it was performed nearly two decades ago, and now supernatural media has become so commonplace that it is likely the shows either forgo a disclaimer, have a false claim that the story is based on true events, or people are so used to the disclaimer they no longer pay it any attention. The third and final article I found, written in the British Journal of Psychology by Susan Blackmore and Tom Troscianko, discusses the likelihood that accounts of paranormal activity are simply misinterpretations of events. This explanation for the number of reported supernatural occurrences is very probable, since people usually fall back on the easiest or safest explanation they can if they are afraid to learn the real answer. An example of this might be religion, since there is not concrete proof of the existence of God, but millions upon millions of people continue to believe. As Andrew mentioned in class, there are people that will simply deny anything that goes against their personal belief, even if there is supported evidence pointing to the contrary. Another example is the cupboard ghost. The man in the video could not discern a natural cause for his cupboard door to open on its own, so his mind provided him with ghosts as an easy answer. Perhaps the door handle mechanism was not installed correctly, or his house had a rodent infestation, but the answer that man came up with was: the supernatural is behind it. It is difficult to find more recent polls or statistics regarding the issue of the paranormal today, because most of the surveys cover either a very specific or extremely general range of paranormal beliefs, so the overall results tend to vary. There also aren’t many studies that ask people why they believe in the paranormal, just whether or not they do. From the studies I have found, however, I believe most people take to the paranormal easily because they want to explore something outside the realm of the scientifically explained, media makes it an intriguing and sometimes frightening and thus thrilling subject, and people fear the repercussions of the real answer to the situation. This entry was posted in Uncategorized on November 16, 2016 by Emma Schadler.